From the single, available picture of him, the Rev. 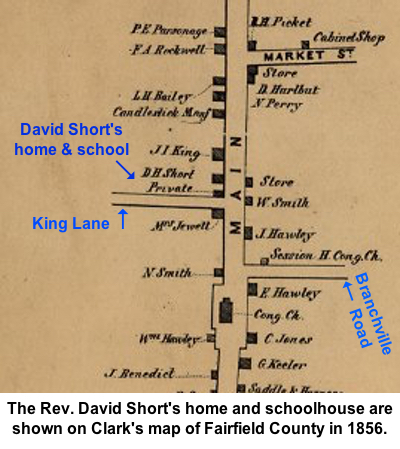 David Short appears to bear out a student’s description of him as “strict disciplinarian.” Dr. Short must have been doing something right: During the dozen years he ran his little school on Main Street, he turned out two graduates who became Connecticut governors and one who was a U.S. Army general. David Hawkins Short, D.D., was born in 1806, some say in the Southport section of Fairfield and others, in Derby. In 1833, he graduated from Washington College in Hartford, now known as Trinity College. He must have been well-respected there; in the late 1850s, he was named a member of the Board of Fellows of the school. The board, which still exists today, was created “as the college's examining body, ensuring that our high aspirations for academic accomplishment were realized,” the school says today. Around the same time, he was also awarded honorary membership in Phi Beta Kappa. After Trinity, he headed to New York City where he received a doctor of divinity degree from the General Theological Seminary of the Protestant Episcopal Church. He was ordained a deacon in 1836 and a priest a year later. By 1838, he was serving as rector of both St. Paul’s Episcopal parish in Brookfield and St. James Church in Danbury; he remained at both until 1842, and then spent two years with North Salem and Somers, N.Y., parishes. Over the years he did stints as rector of St. Mark’s in New Canaan, St. Matthew’s in Wilton, Christ Church in Redding, St. James in Winsted, and Grace Episcopal in East Windsor. 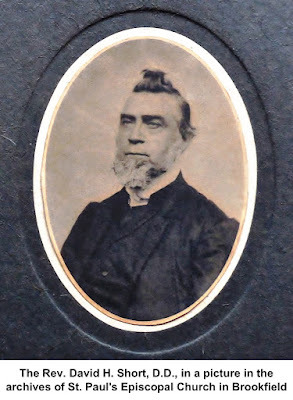 From 1866 to 1872, he was “supplying different parishes,” according to an old church record, and his last assignment as a rector was from 1872 to 1876 in the Northford section of Branford. 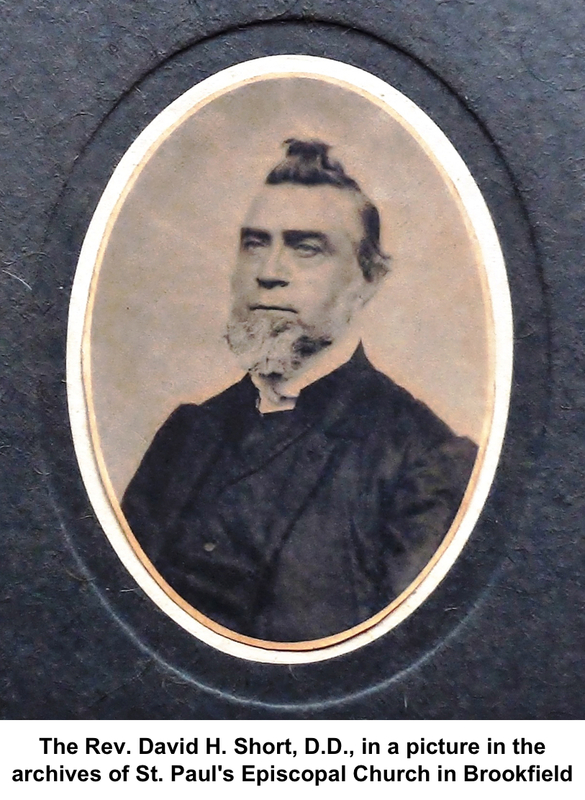 Dr. Short was also rector of St. Stephen’s Church in Ridgefield, but lasted a mere five months in 1845-46. Perhaps it was to help support a growing family and seek a new direction in life that David Short decided to open a private school here. Short had been through a lot of sadness before he came to Ridgefield. In 1837, he married Mary Emeline Gregory and a year later, tragedy struck. Records vary, but she apparently gave birth to at least one, possibly two, and maybe three children in August 1838. One or two of the babies died the same day. And Mary herself died four weeks later; she was only 22. In 1840, Short married Mary Elizabeth Purdy. They soon had a son, Isaac, who died as a child, and a son William, who became an Episcopal rector in Missouri and who died in 1905. Around 1844, the Shorts acquired a house on Main Street at the corner of King Lane where David decided to try teaching as a more reliable source of income. He established a private school for both boys and girls — co-ed schools were somewhat unusual for the era — and apparently met with some success. The school operated from at least 1844 to 1857. Among its more illustrious graduates was Phineas C. Lounsbury, who was to become the 53rd governor of Connecticut. One can only imagine what those “little attentions” were. Among the graduates were not only Phineas Lounsbury, but also his brother George — also a governor — Army General David Perry, and D. Smith Gage, who became one of the town’s wealthiest businessmen in the 19th Century (all three are profiled in Who Was Who). By 1859, Short had left Ridgefield and was serving as a rector in Winsted, a community Litchfield County. His second wife, Mary, had died in 1853 and in 1859, he married Cornelia Sherwood. She was 30, he 52. Perhaps their marriage had something to do with his giving up teaching and returning to church work. A year later, they had a son, but he died at the age of 1. In 1870, the census says he was living in Fairfield, the town where some records say he died in 1877 at the age of 70. In his last will and testament, Short left his furniture to his wife and daughter, Mary, and two black walnut bookcases full of books and writings to his minister son, William. He had no other property.